Can you believe that I could get somewhere – anywhere at 6:15 a.m.? Good, that means you know me pretty well. I got there at 6:25 a.m., complete with camera, but my disk had no space AND no pictures. What’s up with that? I learned how to format my disk today because of it. Needless to say, I was a little late to my assigned post, but I got there. It turned out that many people came to help, so I didn’t have much to do, but enjoy the day. 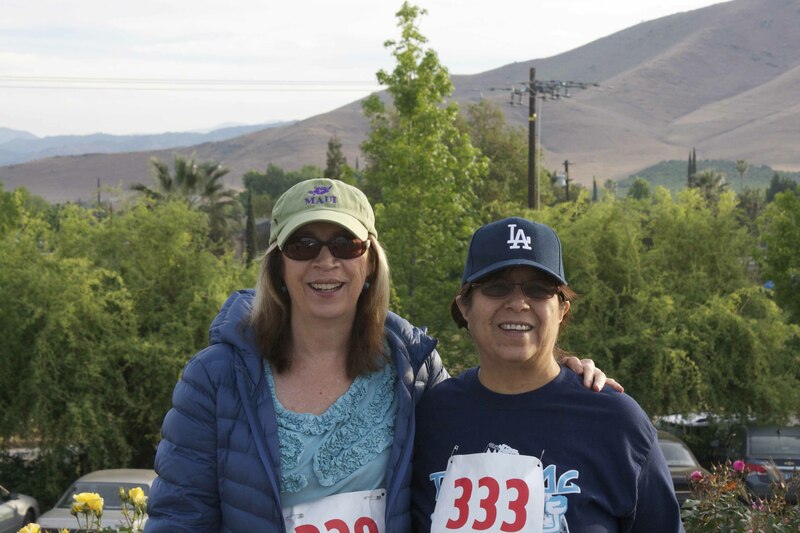 My very good friend Connie from Tulare County Office of Education (TCOE) showed up, and we walked the path slowly, relishing the chance to catch up . The day was off to a lovely start. The temperature was cool enough that I appreciated my coat for a while, then quickly shed it, as we strolled into last place. Altogether 73 runners and walkers participated in this fund raiser. All the proceeds from the event go to the Woodlake Food Pantry. It’s a real privilege to be part of a community organization that gives so much back to the community. How was your Saturday? What is your favorite charitable organization or fundraising activity? The early start was well worth it. Well done to all of you! I am couldn’t past the photo in the header, an absolute ripper. My saturday was okay. Glad you had a great day. Loved all your pictures, Marsha. What a nice day you all had. That two-mile walk is manageable and would be really nice. I’ve done a 20-mile, all-day walk for charity before, but it was pretty rough. What a great thing to do, Marsha. I love the pics! Thank you so much Dianne. Wow, brain tumor! My best friend’s husband had 21 cancerous brain tumors when they finally discovered them. He was nearly symptom free. We played cards about 3-4 times a week, and my husband would complain that he sometimes bid so poorly that he didn’t understand what in the world he was thinking, but even so we had NO clue that he had brain tumors. Such a scary thing, brain tumors. Good for you to support that organization. 🙂 Well done to you! I think that is an untrimmed tree. Or maybe a court jester tree. Ther is one in Augusta that looked like that and I always thought it looked like a court jester. Anytime there is a round-up for hunger in America you can count me in. Kudos to you and everyone else that participated.